Jeremy and I have finally returned from our four-month stint in Europe. While I’ll miss the travelling, excellent food and magical sunsets, it’s always good to come home to San Diego—and all my crafting supplies. Contrary to most peoples’ European adventures, I usually return with an empty suitcase. I get so tired of lugging a heavy suitcase around that I donate most of my clothes to charity along the way. So, left with only a few items of summer clothing, I decided to start sewing my own clothes. 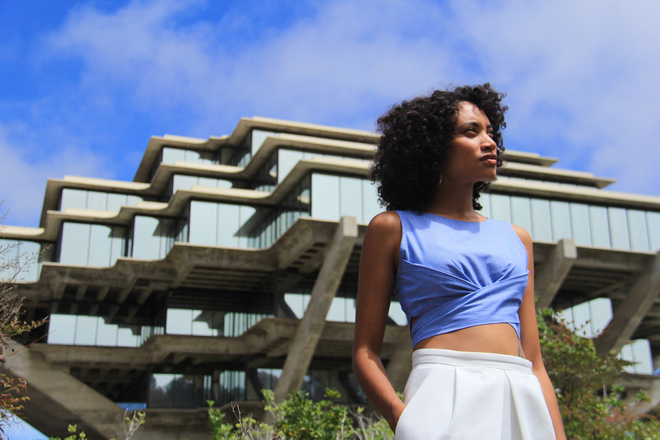 This wrap crop top is perfect for summer. 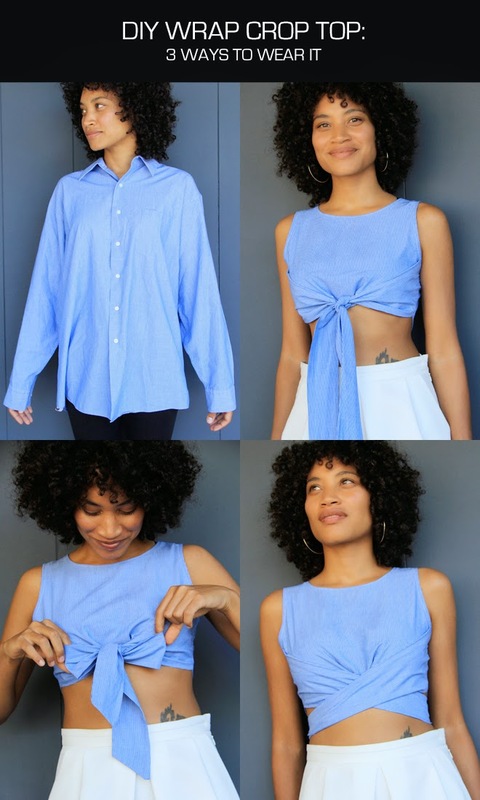 The crop top can be worn 3 different ways: knotted in front; tied in a front bow; (or my personal favorite) wrapped around the body and tied at the back. It’s the first garment I’ve ever made from scratch and without a pattern. 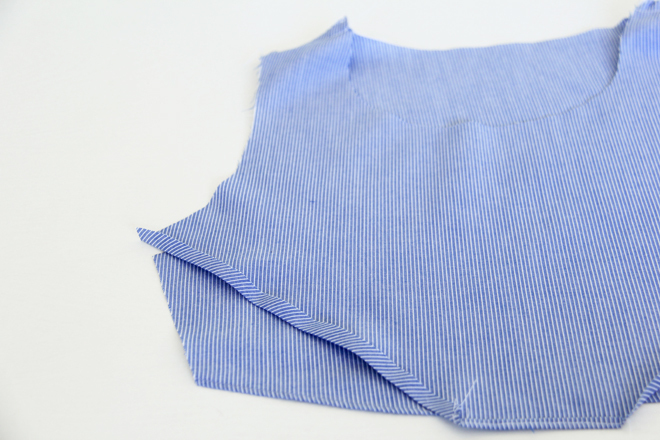 I harvested fabric from a second-hand men’s shirt, sized large (I love a good recycle project!). 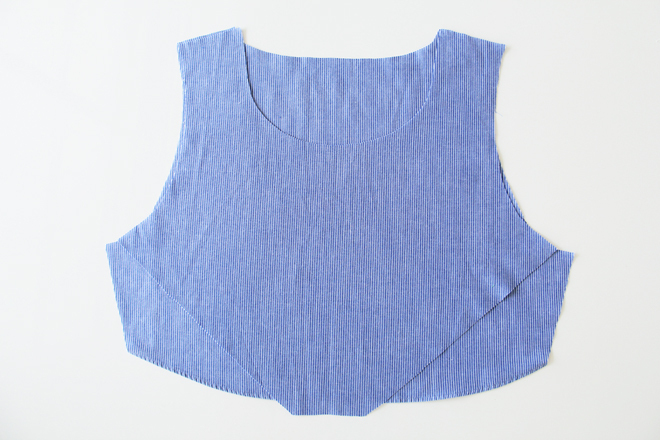 This wrap crop top pattern will fit a U.S. size 2-4. 1] Print and cut out templates. 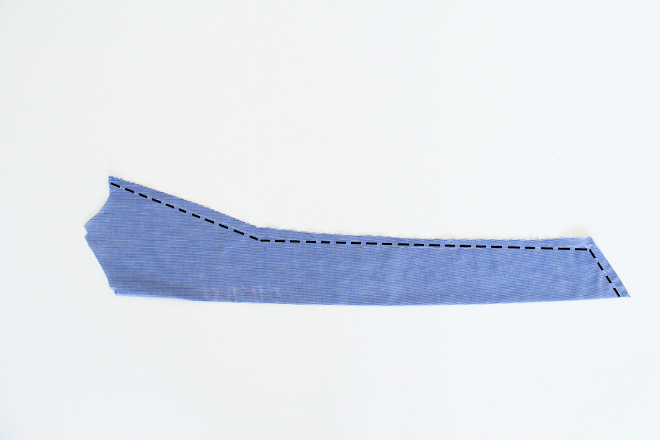 2] Cut out your fabric pieces, as well as 3 long bias strips. 4] Fold the front bottom edge ¼ “ and iron flat. Repeat and sew edge. 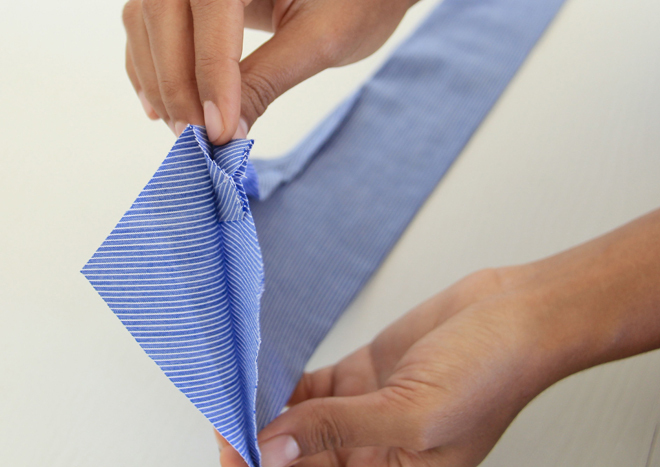 Sew the back bottom edge the same way. 5] Fold the front angled edge ½“ and iron flat. 6] With right sides together, sew the side panels at ½“. Leave the side seam open. 7] Turn the side panels right side out. 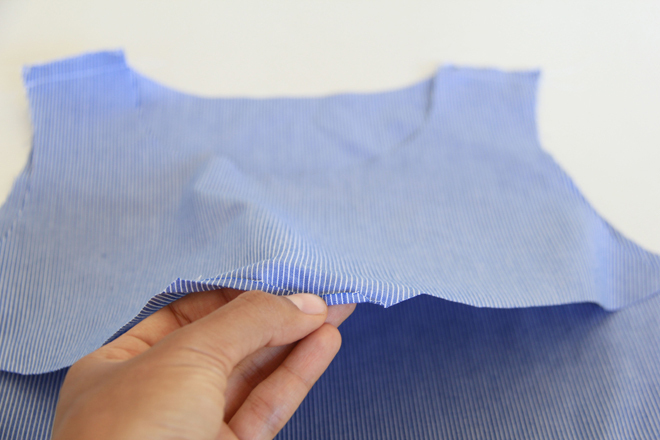 Fold the top seam of your side panel about an inch towards the center, creating 2 ridges. Do this for approximately 9”, tapering the fold as you go. Iron flat. 8] Fold one ridge of the side panel down and iron. Do this on opposing sides to create the left and right panel. 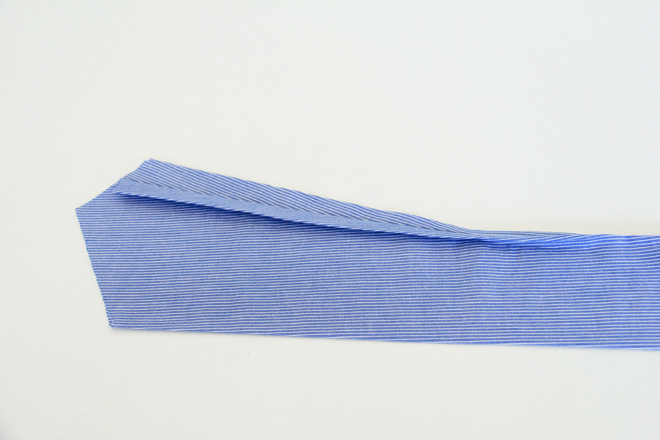 The flap that is ironed down will be sewn on the inside of the top. I hope my images help to explain this step. 9] Pin the side seams of the side panel and the back of top together. Sew. 10] Pin the turned down edge of the side panel to the front of the top. Sew to ½” from bottom edge. Make sure not to sew through the front of the side panel. 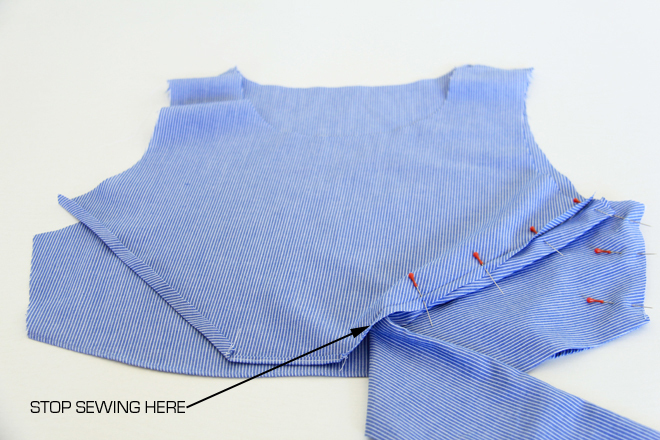 11] Finish the neckline and armholes with bias tape and any raw edges with a zigzag stitch. 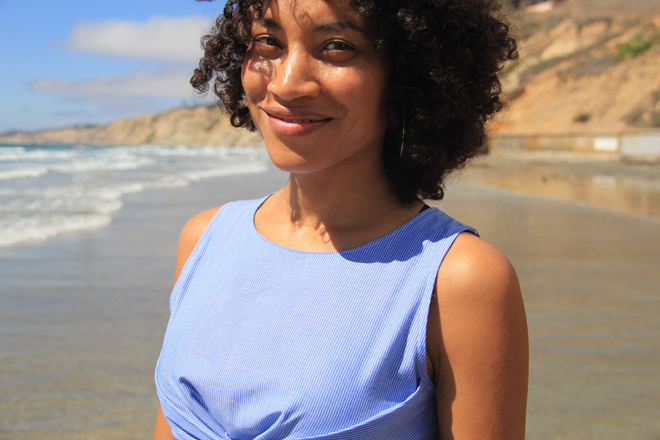 This is a really fun little crop top, which I definitely be wearing all summer long. I’ll be making a few more garments for summer and fall, so stay tuned. 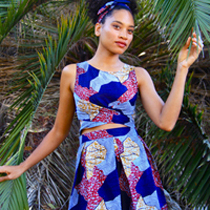 Also, don’t forget to subscribe or follow on Bloglovin to get free patterns and tutorials in your inbox. You can also share the love by liking The Felted Fox on Facebook. Have a great day and thanks for stopping by, Nicole.